i just wanted to acknowledge that the term "pacifism" covers a variety of differing positions and a web of related-issues. A Christian may coin herself a "pacifist," yet refer to any of the following positions. (1) All violent action is morally forbidden for Christians. (3) Christians may participate in war, but only non-violently. (4) Christians may not participate in the military at all. (6) Christians may not occupy any government post. (7) Christians may use force, but never lethal force. acting as an agent of the state. Notice, some combinations of these positions can be held simultaneously, and other combinations are incompatible. (Did i leave out anybody?) 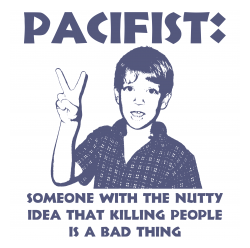 i do consider myself a pacifist, but i honestly don't know just how many of the above i accept. i definitely don't accept them all. But i would like to write some posts that explore what the Bible has to say about these. I enjoy reading your blog. It is one of my favs. Keep up the great work you do brother. You are always in my thoughts and prayers. I hope you have a great day!! !